Being Vesak Day, the wife and I with our little son in tow were at The Singapore Buddhist Lodge, a rather large temple located at Kim Yam Road, to perform our annual "bathe the Buddha" ritual. 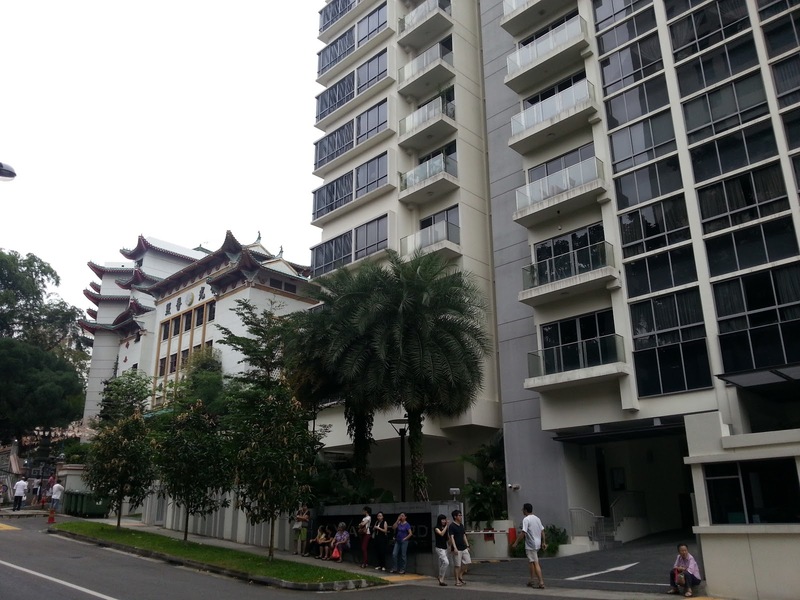 While waiting in line with about 40 people ahead of us, we cannot help but notice the residential development situated next to the temple. The development concerned is Waterford Residence, a 999-year leasehold condominium consisting of 118 units completed in 2011. As you can see in the photo, the condo is built literally next to the temple. 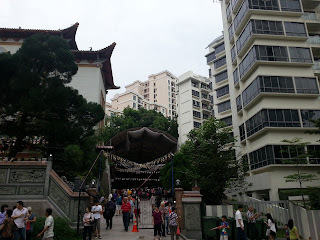 While we all know that the 3 main criterias for property purchase (whether for own-stay or investment) is "location, location, location", the wife and I cannot help but wonder if many people will consider beyond the usual "District Number", "Proximity to MRT stations and amenities" and "within 1-km of choice schools". We do not know how many of the occupants within the 118 units at Waterford Residence are Buddhists. 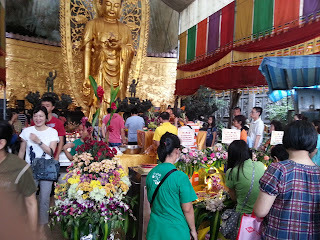 However, if you decide to purchase an apartment next/nearby to a temple (and a rather huge and popular one for that matter), you better be mentally prepared for the "inconveniences" that are typically associated with having large number of people moving in and out of the building next-door to yours, and the ocassional frustrations of double-parking along the 2-lane Kim Yam and Martin Roads. This is especially so during the first and fifteenth day of each Lunar Calendar month and major Buddhist festivals. But if you ARE a Buddhist (more so if you are a devout one) however, you will probably find calm and peace from the constant Buddhist chants from next-door. 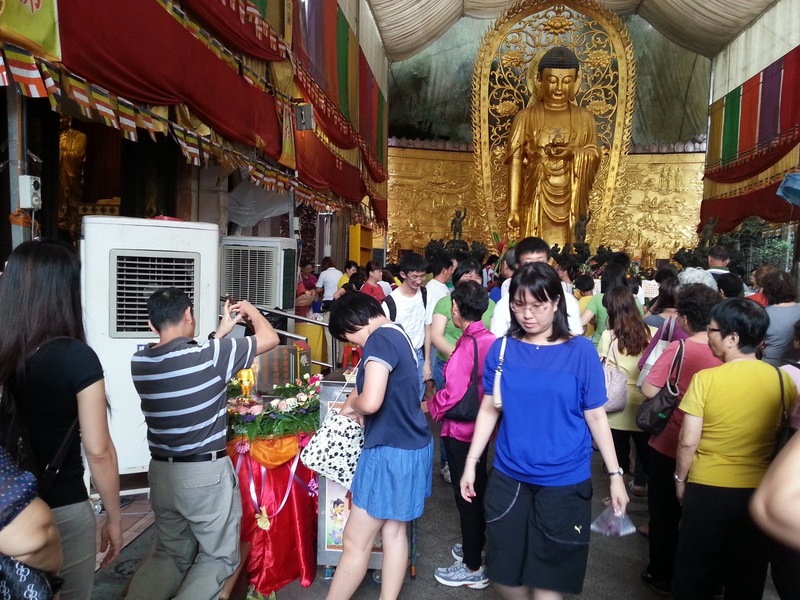 And on every Vesak Day, you will probably be the first in line for "bathing the Buddha"! On the flip side, you must also be prepared to tolerate people using the ledge of the water feature oustide your condo as a resting place while waiting for taxis or transports. So the next time you go house hunting, you may want to add "Is the condo located next to a building of religious worship?" to your list of considerations. And just so we are clear, the wife and I are firm believers of religious tolerance and harmony. But we are not big fans of crowds and heavy traffic along our front yard. 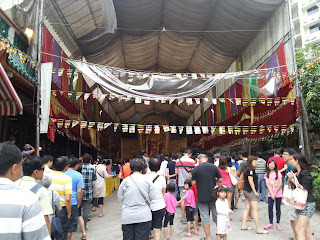 1 comment to ''Vesak Day-inspired piece..."
We enjoyed staying next to a church.